In this quickstart, you learn to create a storage account using the Azure portal, Azure PowerShell, or Azure CLI. This quickstart requires the Azure PowerShell module Az version 0.7 or later. Run Get-Module -ListAvailable Az to find your current version. If you need to install or upgrade, see Install Azure PowerShell module. You can also install and use the Azure CLI locally. This quickstart requires that you are running the Azure CLI version 2.0.4 or later. Run az --version to find the version. If you need to install or upgrade, see Install the Azure CLI. Log in to your Azure subscription with the Connect-AzAccount command and follow the on-screen directions to authenticate. 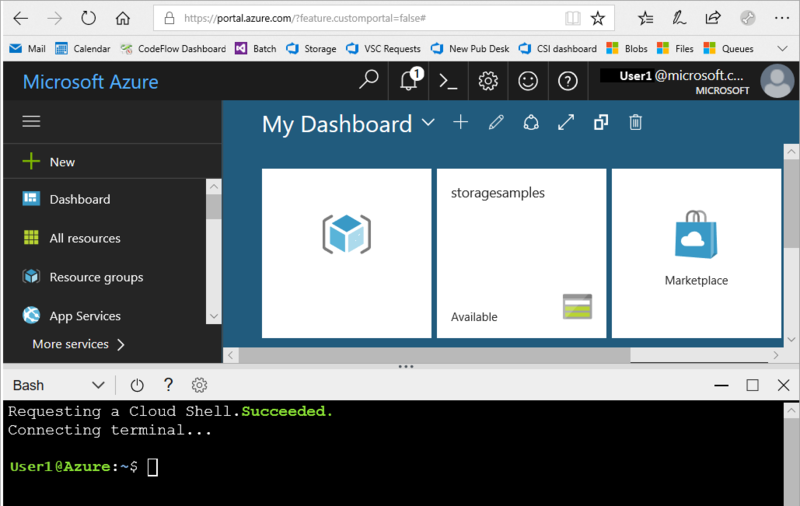 To launch Azure Cloud Shell, log in to the Azure portal. Now you are ready to create your storage account. Every storage account must belong to an Azure resource group. A resource group is a logical container for grouping your Azure services. 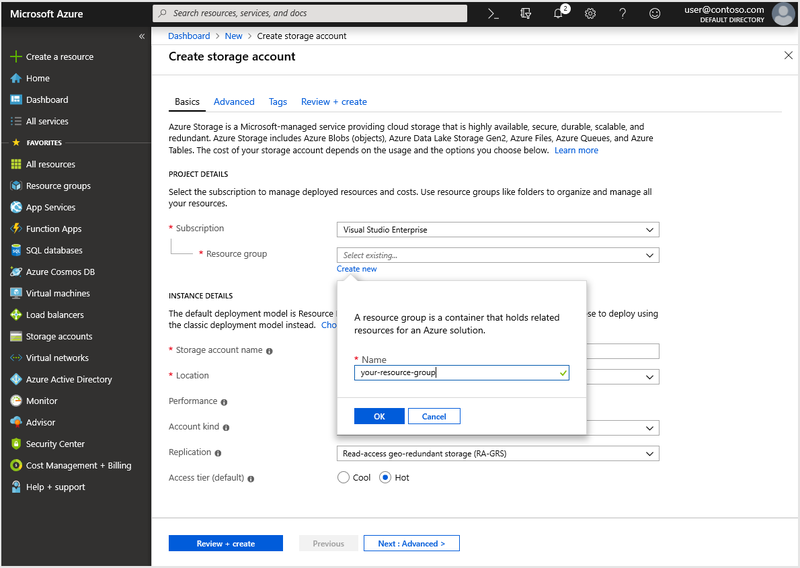 When you create a storage account, you have the option to either create a new resource group, or use an existing resource group. This quickstart shows how to create a new resource group. A general-purpose v2 storage account provides access to all of the Azure Storage services: blobs, files, queues, tables, and disks. The quickstart creates a general-purpose v2 storage account, but the steps to create any type of storage account are similar. To create a general-purpose v2 storage account with zone-redundant storage (ZRS) (preview), geo-redundant storage (GRS), or read-access geo-redundant storage (RA-GRS), substitute the desired value in the table below for the SkuName parameter. First, create a new resource group with Azure CLI using the az group create command. If you're not sure which region to specify for the --location parameter, you can retrieve a list of supported regions for your subscription with the az account list-locations command. To create a general-purpose v2 storage account with zone-redundant storage (ZRS Preview), geo-redundant storage (GRS), or read-access geo-redundant storage (RA-GRS), substitute the desired value in the table below for the sku parameter. You can use either Azure Powershell or Azure CLI to deploy a Resource Manager template to create a storage account. The template used in this quickstart is from Azure Quickstart templates. To run the scripts, select Try it to open the Azure Cloud shell. To paste the script, right-click the shell, and then select Paste. Additional storage account template samples. For more information about available replication options, see Storage replication options. If you wish to clean up the resources created by this quickstart, you can simply delete the resource group. Deleting the resource group also deletes the associated storage account, and any other resources associated with the resource group. In the Azure portal, expand the menu on the left side to open the menu of services, and choose Resource Groups to display the list of your resource groups. Locate the resource group to delete, and right-click the More button (...) on the right side of the listing. Select Delete resource group, and confirm. To remove the resource group and its associated resources, including the new storage account, use the az group delete command. To remove the resource group and its associated resources, including the new storage account, use either Azure PowerShell or Azure CLI. In this quick start, you've created a general-purpose v2 standard storage account. To learn how to upload and download blobs to and from your storage account, continue to the Blob storage quickstart.